It might indeed be the race that stops the nation, but it also speeds the anger of those against it. The anti-Melbourne Cup take is now part of the big day, on equal footing as being stooged in the office sweeps and/or voiding your bowels or hire suit warranty after leaning too far into the concept of champagne breakfast. Yesterday was no different, we unified behind hashtags and spoke in pointed unequivocal terms. Up with this, we will not put. Not again. Not like 2017, 2016, or 2015. Enough is enough is enough is enough. We were even blessed with the death of a runner, a shining relevant example of our righteousness. In the age of the macro attention span, we didn’t need to cycle back for evidence to underpin our point, it was happening in front of us. I’m not marginalising your point, or your opportunity to say it, I’m questioning the depth of your feeling. I’m in the same horse float. I dislike the Cup, and I dislike needless equine death. Having a nag publically put down is terrible, but I wonder whether we’re going to make an effort to halt the Cup Carnival in the months between now and the next first Tuesday of November, or just wait it out until the 2019 running of? There’s an old adage, one that burns anew, in that the standard that you walk past, is the one you accept. I get it, it’s difficult, we’re busy, and the problem seems too great, and our effect too small. We say something on Twitter, or Facebook, or wherever, because we can, and because it’s better than saying nothing. 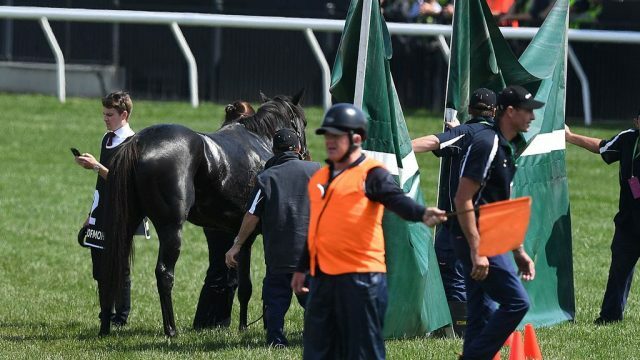 But the horse neighs for thee, perhaps the grim visceral end of Cliffs of Moher should not solely be the issue, perhaps it should be the 118 more that have died on the turf this year, their end met in front of far few, racing in backwater places that don’t have the storied glamour of Flemington. I’m sad, grief stricken, and bloody furious frankly. It’s an interesting point to those who care. Being honest, that’s not me. Despite my largesse of feeling, I’m not about to pick up arms against the horse racing establishment, as much as I emboldened to take on the race-ifi-cation of the Opera House. I was very angry, and I said yes to the light-based protest, but I didn’t go – but I was pleased with the result. I’m not unique, that’s entirely my point. I’m a macro-slacktivist, no different to those who plaster anti-globalist sentiment on Inner-West walls, duplicating my middle finger to the system by using the luxuries the same system provides. If we’re serious, our anger, our drive and our passion should bleed over into the days after the carnival. If we’re serious, we should turn to those who fight this battle every day of the calendar, not just one. If we’re not prepared to do that, we should recognise who our demonstration is in aid of…ourselves. I’m with you Jane! I apply the same philosophy to Grand Final Day & find it works well  Not every Australian has to be obsessed with sport.